The reporting has two components: an immediate preliminary report upon becoming aware of the reportable incident (by phoning the 24 hr CNSC Duty Officer at 613-995-0479 or the toll-free # 1-844-879-0805), followed by an incident investigation 21-day report. any action that was taken by the University or is proposed to be taken. The 21-day report must contain the regulatory requirements applicable to the incident. The Licensee shall obtain written approval from the Commission or a person authorized by the Commission before starting any work requiring the use of more than 10,000 exemption quantities of a nuclear substance at a single time. This is listed as: Condition 2. 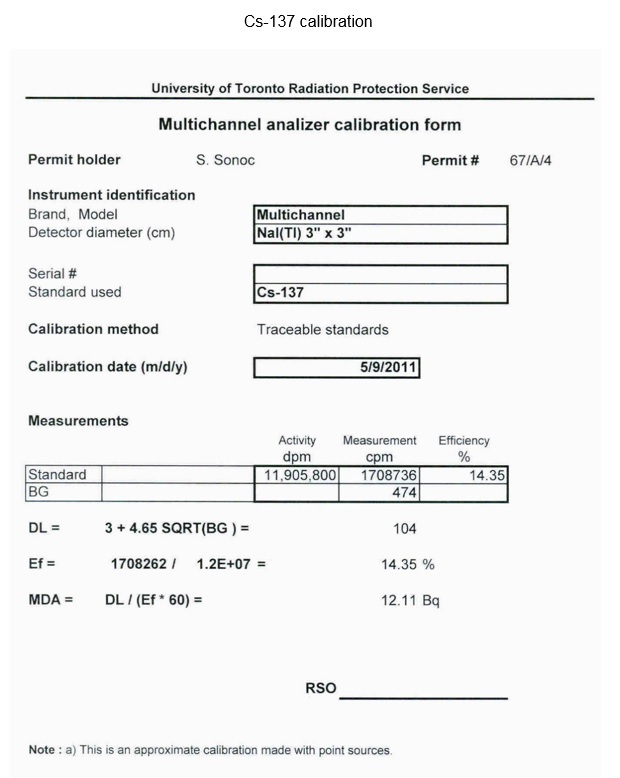 Project Approval: University of Toronto’s Nuclear Substances and Radiation Devices Licence. The laboratory classification is connected with the ALI. ALI or “annual limit on intake” means the activity, measured in becquerel, of a radionuclide that will deliver an effective dose of 20 mSv during the 50-year period after the radionuclide is taken into the body. (e) special purpose if approved in writing by the Commission or a person authorized by the Commission. Except for the basic-level classification, the licensee shall not use unsealed nuclear substances in these rooms, areas or enclosures without the written approval of the Commission or a person authorized by the Commission. This is listed as: Condition 5: Area Classification: University of Toronto’s Nuclear Substances and Radiation Devices Licence. the SRSO or his delegate will inform the CNSC immediately, and will prepare and send a report to the CNSC within 21 days ( see: NSRD 38 (2)). the SRSO or his delegate must inform the CNSC immediately, prepare and send a report to the CNSC within 21 days. If the dose of radiation received by and committed to a person or an organ or tissue, may have exceeded the dose limits (as identified in chapter 1.1.8.1), the person must stop performing any work that is likely to add to the dose. The person may return to radioactive work only with the CNSC approval. All NEWs must read and understand the information provided, acknowledging their designation by signing the following form. The approved copy of the designation form must be kept by the RPS. As required by the Radiation Protection Regulations of the Canadian Nuclear Safety Commission, this information is being provided to all staff designated as “Nuclear Energy Worker”. 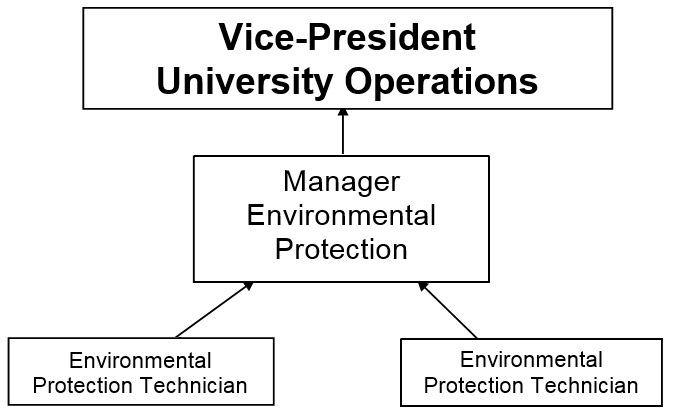 The regulation requires the University to designate users of nuclear materials as “Nuclear Energy Workers” if there is a reasonable probability of receiving an effective dose greater than that allowed to members of the general public (1 mSv per annum whole body). Effective dose limits for Nuclear Energy Workers, including a pregnant nuclear energy worker, are 50 mSv for any one-year dosimetry period, but must not surpass 100 mSv for any 5 year dosimetry period. A pregnant nuclear energy worker must not receive an effective dose of greater than 4 mSv for the balance of the pregnancy. The balance of the pregnancy is defined as “the period from the moment a licensee is informed, in writing, of the pregnancy to the end of the pregnancy”. A female Nuclear Energy Worker, on becoming aware that she is pregnant, must notify the permit holder and Radiation Protection Service immediately in writing. The licensee shall make any reasonable accommodation to maintain effective doses As Low as Reasonably Achievable (Radiation Protection Regulations, Section 11). The University of Toronto stresses adherence to the ALARA policy of maintaining doses As Low As Reasonably Achievable. All radiation programs are directed towards your safety, ensuring that the potential for exposure is minimized. The Radiation Protection Service is available to answer any questions which you may have. I have read the information provided regarding my designation as a Nuclear Energy Worker, as defined by the regulations. I understand the risks, my obligations, and the radiation dose limits that are associated with being designated a Nuclear Energy Worker. I confirm my acceptance of this designation. Tritium, because of its low beta-energy, cannot be monitored directly and therefore special care is needed to keep the working environment clean and tidy. Regular monitoring by counting swipes is advisable in areas where this nuclide is used. Tritium can be absorbed through the skin. Volatile compounds containing tritium, tritiated water and tritium gas should be handled in a fume hood. External contamination, although not causing a radiation dose itself, should be kept as low as possible as it can lead to internal and hence hazardous contamination; it can also interfere in experimental results. DNA precursors (e.g. tritiated thymidine) are regarded as more toxic than tritiated water partly because activity is concentrated into cell nuclei. This is reflected by lower ALI’s for the material in this form. Bioassays may be required for handling high amounts. Consult permit. Shielding required 1 cm Perspex/Plexiglas. Thinner Perspex/Plexiglas down to 3 mm, although adequate to reduce doses, does not have good mechanical properties. Glass containers, although not generally recommended for shielding of beta radiation, are effective for small quantities of 14C. There is a possibility that some organic compounds can be absorbed through gloves. Care needs to be taken not to generate carbon dioxide which could be inhaled. Work with volatile compounds or those likely to generate carbon monoxide or carbon dioxide in fume hood. Phosphorus-32 is the highest energy beta emitting radionuclide commonly encountered in research laboratories and as such requires special care. Avoid exposure as much as possible (e.g. do not hold tubes containing even small quantities of 32P any longer than necessary – use a stand or holder). If quantities greater than a 50 MBq (1.35 mCi) are used, whole body and ring dosimeters must be worn. The use of lead-impregnated rubber gloves is also recommended. Even with low-density materials (for example, Perspex/Plexiglas) the absorption of the beta-particles gives rise to relatively high energy Bremsstrahlung which may require some lead shielding when quantities greater than a few hundred MBq (or tens of millicuries) are being handled. Solutions containing more than 1 mCi (37 MBq) of 32P or carrier-free solutions of 32P require specific handling precautions. Carrier-free material is readily absorbed by the skin and will contribute significant doses to the bone where it is preferentially deposited. Careful handling can avoid high radiation doses to the hands while working with this material. A solution of phosphate buffer is most effective in removing 32P contamination from surfaces. Phosphorus-33 is moderate energy beta emitting radionuclide, commonly encountered in research laboratories. Laboratory coats and gloves are the principle protection since skin dose and contamination are the primary concerns – approximately 14% of P-33 beta particles can be transmitted through the skin. Drying can form airborne P-33 contamination. Shielding required 1 cm Perspex/Plexiglas. Thinner Perspex/Plexiglas down to 3 mm, although adequate to reduce doses, does not have good mechanical properties. Glass containers, although not generally recommended for shielding of beta radiation, are effective for small quantities of 35S. Note that organic compounds are often strongly retained and no limits of exposure have been set for them. Be careful not to generate sulphur dioxide or hydrogen sulphide which could be inhaled. Radiolysis of 35S-amino acids during storage and use may lead to the release of 35S-labelled volatile impurities. Handle such material in fume hood. Although the level of these impurities is small (typically less than 0.05%), contamination of the internal surfaces of storage and reaction vessels may occur. Vials should be opened and used in fume hoods. Shielding required 1 cm Perspex/Plexiglas cuts out all betas. Glass containers, although not generally recommended for shielding of beta radiation, are effective for small quantities of 45Ca. In general Calcium-45 does not require any special precautions over and above those necessary for any beta-emitting radionuclide of this energy of emissions. The majority of Calcium-45 is deposited in the bone: retained with a long biological half-life. In general Chromium-51 does not require any special precautions over and above those necessary for any radionuclide of this energy of emissions. Chromium-51 in the form of chromate is not selectively absorbed by any organ in the body. Near an unshielded 59Fe source, dose rates from beta radiation can be much higher than dose rates due to gamma radiation. Store 59Fe behind lead shields. Avoid direct eye exposure by interposing transparent shields or indirect viewing. Urinalysis to determine uptake is only effective from 4 to 24 hours after handling 59Fe. Wear extremity and whole body dosimeters while handling more than 1.35 mCi (50 MBq) quantities. Handle potentially volatile compounds and powder in fume hoods. Shielding required Perspex/Plexiglas if necessary. Glass containers, although not generally recommended for shielding of beta radiation, are effective for small quantities of 63Ni. Millicurie quantities of 63Ni do not represent a significant external exposure hazard since the low energy betas emitted cannot penetrate the outer skin layer. The critical organ for 63Ni is the bone. The elimination rate of 63Ni depends on the chemical form. A few percent of most compounds taken into the body are eliminated via the urine. Handle 63Ni compounds which are potentially volatile or in powder form in fume hoods. Many 63Ni compounds cannot be detected with sufficient sensitivity by liquid scintillation counting (LSC) of small volume urine samples. If insoluble compounds are handled, 24-hour urine samples should be periodically collected and analyzed (LSC) to ensure that controls are adequate. Volatilization of iodine is the most significant problem with this isotope. Simply opening a vial of sodium [125I] iodide at high radioactive concentration can cause minute droplets of up to 100 Bq to become airborne. Solutions containing iodide ions should not be made acidic nor stored frozen: both lead to formation of volatile elemental iodine. As some iodo-compounds can penetrate surgical rubber gloves, it is advisable to wear two pairs, or polythene (polyethylene) gloves over rubber. In the event of suspected or actual significant contamination of personnel the thyroid should be blocked by administration of stable iodine as tablets of potassium iodate (170 mg) or potassium iodide (130 mg) which are available at hospitals. To render any spilled Iodine-125 chemically stable the area of the spill should be treated with alkaline sodium thiosulphate solution prior to commencing decontamination. Note, however, that the quantity of radioiodine in normal RIA kits (usually <2 MBq or 54 microCi) is such that these can be handled safely with reasonable care on the open bench. during the experiment and afterwards, monitor the area with appropriate detection equipment. A solution consisting of 0.1 M sodium iodide, 0.1 M sodium hydroxide and 0.1 M sodium thiosulphate is effective in cleaning radioiodine spills. Wash hands immediately following a radioiodine procedure. Contact the RPS immediately in case of spill of free radioiodine. At the University of Toronto, a wide variety of sealed sources are used in various different applications. These range in size from large sources containing hundreds of TBq (kCi) to very small sources of less than a few tens of kBq (µCi). The Canadian Nuclear Safety Commission’s regulations require that leak tests are performed on most sealed sources. The exceptions are gaseous sources, sources of tritium or any other source containing a radioactive prescribed substance which is less than 50 MBq. This document outlines the procedures used for sampling of removable contamination and the analysis of the samples that are taken. 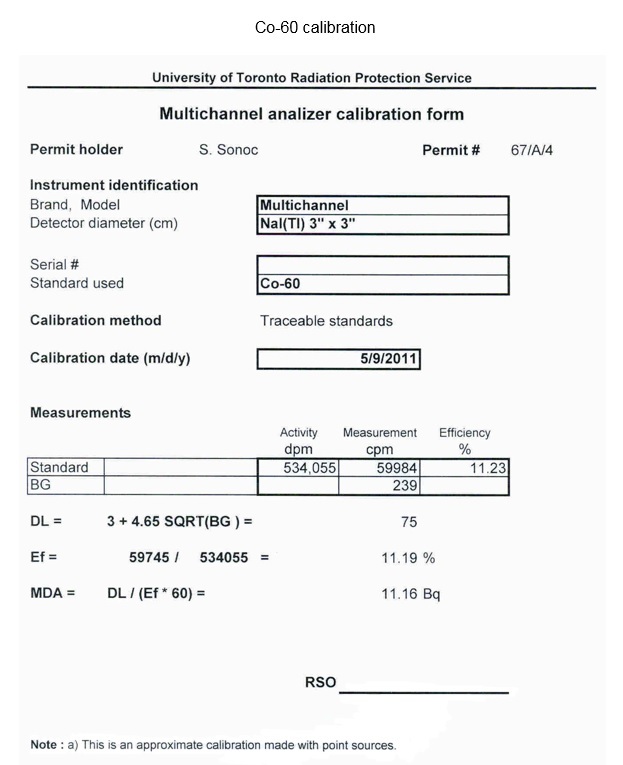 The procedures and equipment described in this document are intended to meet the expectations of the CNSC as outlined in the Appendix of the CNSC/NSRD Licence Application Guide (http://www.nuclearsafety.gc.ca/eng/nuclear-substances/licensing-nuclear-substances-and-radiation-devices/index.cfm). 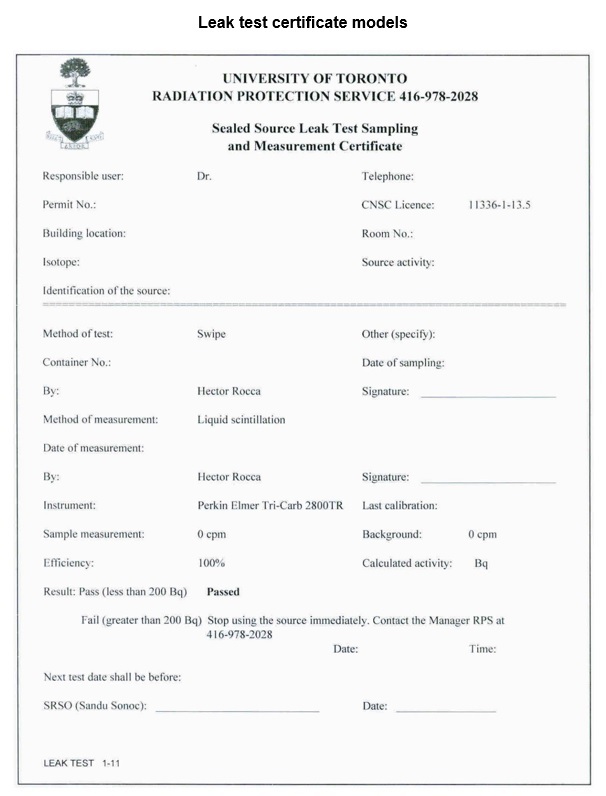 The University of Toronto conducts leak test sampling and measurement of sealed sources under this procedure. In this document, the sampling methods are provided followed by the measurement methods available. 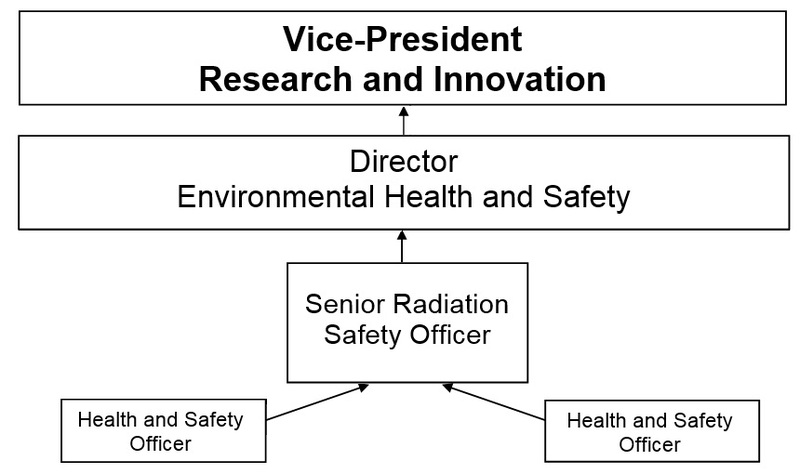 A table of sources and their locations is maintained by the Radiation Protection Service. Finally, a sample copy of a completed leak test certificate is provided. 1.1.1 All samplings are to be conducted by staff of the Radiation Protection Service, unless otherwise authorized in writing. Staff of the Radiation Protection Service is familiar with the sources, their use and the hazards associated with the radiation field that may be encountered near the source. The person taken the samples must be familiar with this procedure. 1.1.2 Survey the surrounding area of the source with a suitable radiation monitor and ensure that there are no excessive radiation field readings. 1.1.3 During the sampling, the radiation monitor should be on and checked regularly to ensure that the radiation does not increase to unacceptable levels. 1.1.4 Follow the procedure of the method for wipes sampling determined by the source type. Samples are collected dry unless otherwise noted. 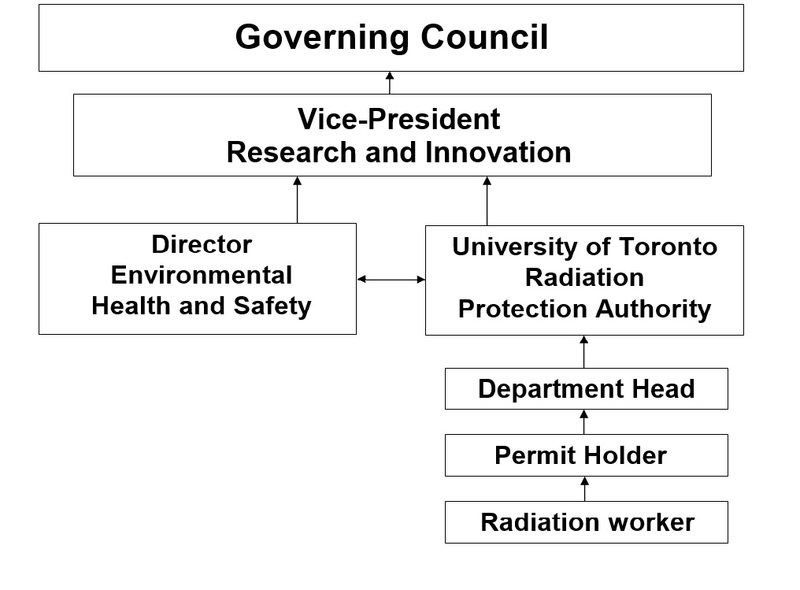 This conforms to the procedure used throughout the University of Toronto for contamination monitoring. 1.1.5 In order for each sample not to be contaminated by any other samples, each envelope should be clearly marked and contain only one sample. 1.1.6 After the sample is taken, the source should be returned to its proper storage position. 2.1.1 Procedure of the Method for Wipe Sampling. 2.1.1.2 After one minute return the source to the storage position using the control panel. 2.1.1.3 Turn off the control panel. 2.1.1.4 Open the shielding to access the sample chamber. 2.1.1.5 For swiping, use one quarter of a circular piece of filter paper 9 cm in diameter. The filter paper is used because it removes any free particles form the surface of the source. 2.1.1.6 Hold the filter paper with a pair of tweezers. 2.1.1.7 Swipe the surface of the irradiator opening with the filter paper. 2.1.1.8 Place the filter paper into a marked envelope which will then be taken to the measuring facility. 2.1.1.9 Make the measurement looking for Co-60 (Gammacell 220) or Cs-137 (Gammacell 20, Nordion 1000 or Nordion 40 Exactor). 2.2 Gamma and Neutron Sources (Applies to sources that can be removed from container). 2.2.1 Procedure of the Method for Wipe Sampling. 2.2.1.1 Place absorbent surface liner near the source container. 2.2.1.2 Remove the source from the storage position using a pair of tweezers or a rod and place it on the absorbent surface liner. 2.2.1.3 For swiping, use one quarter of a circular piece of filter paper 9 cm in diameter. The filter paper is used because it removes any free particles from the surface of the source. 2.2.1.4 Hold the filter paper with a pair of tweezers. 2.2.1.5 Swipe the surface of the source with the filter paper. 2.2.1.6 Place the filter paper into a marked envelope which will then be taken to the measuring facility. 2.3 Gamma Calibration Source (Applies to sources that cannot be removed from the container). 2.3.1 Procedure of the Method for Wipe Sampling. 2.3.1.1 Remove the screws which hold the shielding of the source in place and then remove the shielding. 2.3.1.2 For swiping, use one quarter of a circular piece of filter paper 9 cm in diameter. The filter paper is used because it removes any free particles from the surface of the source. 2.3.1.3 Hold the filter paper with a pair of tweezers. 2.3.1.4 Swipe the surface of the source with the filter paper. 2.3.1.5 Place the filter paper into a marked envelope which will then be taken to the measuring facility. 2.4.1 Procedure of the Method for Wipe Sampling. 2.4.1.1 Place an absorbent surface liner near the source container. 2.4.1.2 Remove the source form the storage position using a pair of tweezers and place it on the absorbent surface liner. 2.4.1.3 For swiping, use one quarter of circular piece of filter paper 9 cm in diameter. The filter paper is used because it removes any free particles from the surface of the source. 2.4.1.4 Hold the filter paper with a pair of tweezers. 2.4.1.5 Swipe the source environment with the filter paper. 2.4.1.6 Place the filter paper into a 5 ml liquid scintillation sample vial. 2.4.1.7 Place the vial into a marked envelope which will then be taken to the measuring facility. 2.5 Sources within an instrument. 2.5.1 Procedure of the Method for Wipe Sampling. 2.5.1.1 Find the orifice closest to the source. 2.5.1.2 For swiping, use one quarter of a circular piece of filter paper 9 cm in diameter. The filter paper is used because it removes any free particles from the surface of the source. 2.5.1.3 Hold the filter paper with a pair of tweezers. 2.5.1.4 Swipe the source environment with the filter paper. 2.5.1.5 Place the filter paper into a 5 ml liquid scintillation sample vial. 2.5.1.6 Place the vial into a marked envelope which will then be taken to the measuring facility. 3.1.2 Instructions to set-up, operate and measure samples. 3.1.2.1 Turn on the system and wait 2 hours for stabilization. 3.1.2.2 Cover the detector with a thin plastic foil. 3.1.2.3 Set the timer for 600 seconds. 3.1.2.4 Verify the channels under the peak of interest using an appropriate calibration source. 3.1.2.5 Highlight the channels band corresponding to the photon’s energy. 3.1.2.6 Place the sample directly over the detector’s center. 3.1.2.7 Close the top of the shielding. 3.1.2.8 At the end of the measurement register the “gross” counts of the selected peak. 3.1.2.9 Remove the sample and close the shielding back. 3.1.2.10 Measure the background counts under the same conditions. 3.1.2.11 Subtract the background counts from the peak counts. 3.1.2.12 Estimate the activity using the efficiency of the detector. 3.1.3.2 The calibration source is used to check the instrument on an annual basis and after instrument repair or adjustment. 3.1.3.3 The instrument is capable of analyzing to a minimum of 12 Bq. 3.2.2 Instructions to set up, operate and measure samples. 3.2.2.1 At the measuring facility, add 5 ml of the liquid scintillation cocktail2 into the vial. 3.2.2.2 Place the filled vial into the sample tray for measuring. 3.2.2.4 Set the counting time to ten minutes. 3.2.2.5 Place the sample tray containing the sample vial and control vial in the counting position and start to count. 3.2.2.6 Subtract the background counts from the sample counts. 3.2.2.7 Estimate the activity using the efficiency of the counter. 3.2.3 Description of the tests using check sources. 3.2.3.1 Use a Tritium and a Carbon – 14 calibration source to calibrate the instrument. Unquenched H-3 and C-14 samples are available for this assessment. 3.2.3.3 The instrument is capable of analyzing to a minimum of 10 Bq. Appendix G – Sealed Sources Leak Test Procedure, was added.